Another view of the forward end of the S-3D rocket engine. Just above center of this photo is the turbopump's turbine (the greenish disc). 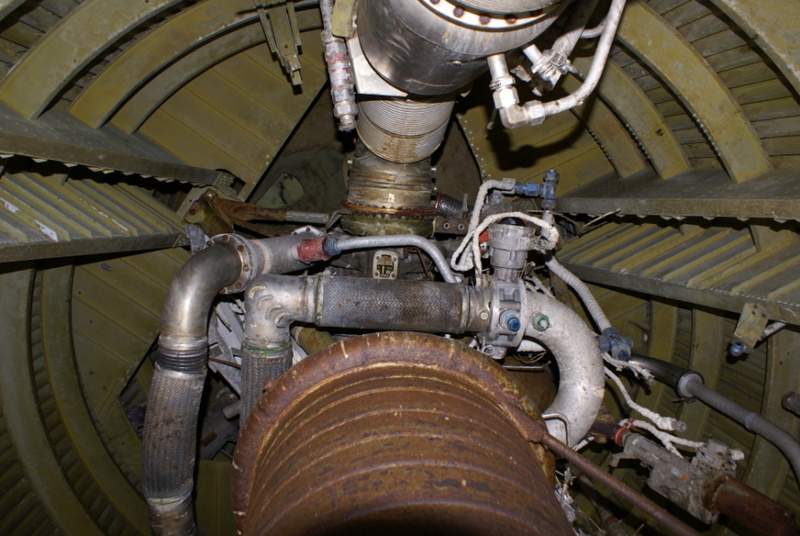 Below the turbine (below the thin silver tubing) is the fuel turbopump; the larger-diameter silver duct at left is the fuel high-pressure duct. Closer to the thrust chamber is the LOX high pressure duct; at right (just left of the curve) is the main LOX valve. Above the turbine, along the top of of the photo, is the turbine exhaust duct and heat exchanger. The heat exchanger still has the tubing feeding the pressurant to the heat exchanger and carrying the heated gas back to the propellant tanks.